I have been a Fallout video game fan for a while. If you have not played one, give it a try. I have played through Fallout 1, 2, 3, New Vegas, and now I'm working my way through Fallout 4. They are all fantastic in their own rights. Yesterday, I was reading up on the history of the Fallout series, and more importantly the history of the IP and the company that came up with it in the first place. What I uncovered was pretty interesting. I was not expecting a tie-in to my other hobby, board gaming. I guess this makes sense, since Fallout or video game rpgs in general are heavily based on pen and paper rpgs. But I found it fascinating to come across a name I know quite well in board gaming, Steve Jackson. We all know the guy, his company is behind games such as Munchkin, Zombie Dice, Ogre, etc. What I didn't know is that he has tie ins with my favourite video game series. Basically, the Fallout series was based off of an old video game rpg called "Wasteland", which was released under Interplay, owned by Brian Fargo. The making of this game utilized a couple of rpg writers (Michael Stackpole, and Ken St. Andre) to write a script for it. Wasteland was released in 1988 and had innovative game play where every choice you made had consequences and changed the world you played in. Furthermore it was unapologetically violent. Incidentally the game was a huge success. So where is the Steve Jackson tie in? Everyone wanted a sequel to Wasteland, but for various reasons it didn't pan out. Now at the same time, Steve Jackson was heavy into RPGs, and around the mid-1980's he innovated the GURPS (Generic Universal Role-Playing System) model of role-playing. Basically it allowed any rpg game to be played in any setting, gave your character four basic stats (Strength, Dexterity, IQ, and Health), skills and advancement. This model was perfect for a post-apocalyptic wasteland. Around 1994 it seemed that Brian Fargo and Interplay approached Steve Jackson about applying his model to Wasteland, eventually with the goal to churn out a PC based game. However, due to some licensing issues with Electronic Arts (EA), Interplay lost the Wasteland IP. And so they had to change the name, eventually giving the project the name Vault-13: A GURPS Post-Nuclear Role-Playing Game. Rule #1: Multiple Decisions. We will always allow for multiple solutions to any obstacle. Rule #2: No Useless Skills. The skills we allow you to take will have meaning in the game. Rule #3: Dark humor was good. Slap-stick was not. Rule #4: Let the player play how he wants to play. Rule #5: Your actions have repercussions. This lead to possible violent gaming, including swearing and killing who you wanted (including children). Furthermore, this violence was represented on screen in an eye-popping (no pun intended) gory fashion. At this point in time, Steve Jackson Games was still involved with the project, however Steve Jackson disagreed with a late draft of the game, with the my internet sources calling it, "creative differences". That being said, it seems it's kind of unknown what exactly happened. I read in one place, that Steve Jackson only watched the opening trailer for the game, and criticized a very violent execution scene found within. Another place says that it could be possible that Interplay was asking Steve Jackson to change too much of his GURPS system to fit for the game, and that wasn't allowed under the contract. And finally, I also read, Steve Jackson was a pretty busy guy building his boardgaming empire leading to a lack of communication. Whatever the reason, in 1997 Steve Jackson Games and Interplay cancelled their partnership leading to some contract issues. Interplay had to stop using the GURPS system, even though the entire game was based on it. They converted character stats over to the SPECIAL (Strength, Perception, Endurance, Charisma, Intelligence, Agility, and Luck) model, which was based off some home-brew AD&D rules. Interplay had 2 weeks to code all this, and they did, releasing it for the PC on September 30, 1997 under the title Fallout: A Post Nuclear Role Playing Game. And that's the history as far as I know it. So go out, and explore the wasteland on PC or console, and know that boardgaming aided in creating a great video game series. Killing children was censored in UK version (and the German but they censor everything ). I still cling on to the hope of Van Buren as Fallout 3 was a shuddering disappointment. I don't think Bethesda quite knew how to make a Fallout game and we ended up with Oblivion in the Fallout universe. Parts of New Vegas recaptured the spirit of the originals but then Fallout 4 came along. Fallout is probably now a great example of what could have been and also don't let your treasured IP slip into the wrong hands. I always figured that some sort of RPG model was used for games like Skyrim, Fallout and other open world RPG video games, but It's cool to read about the full history. I've also been playing through Fallout 4 and have been greatly enjoying it. On the board game side of things, my friends and I started TIME Stories and it reminds me a lot of that style of video game. Perhaps things move in full circles? The lead designer of the original Fallout is a BGG-er and designer of some mighty fine board games. Check out Nemo's War for an example. Loved Fallout 3 & 4! Thanks!! New Vegas I liked but didn't love as much... Maybe because I started on Fallout 3 and never played 1 or 2? 1&2 are very different than the later Fallouts. They're RPGs with a turn based combat system as opposed to the FPS elements introduced later. If you enjoy that kind of game, they're definitely worth trying. The first two Fallout games are amazing, they give the player alot more rp opportunities than the later games. Would love to see a legacy style fallout boardgame at one point. That would be a really interesting game, especially if they incorporated in multiple choices and designing your character. There isn't enough post-apoc games out there that are decent. The original Wasteland/Fallout guy did a kickstarter way back when for a PC game. Is that the same one as the XBox One title shown? Still mad at the Interplay to Bethesda impact on this series. I also liked Fallout Tactics, very board-gamey IMO. Thanks for posting the SJ tie-in, never knew that. Indeed it was. It was first released as a pc game, and then remastered for the console. I believe EA lost the Wasteland IP in the mid 2000s. Brian Fargo was able to wrestle it back to his new company. They even recruited someone from obsidian who worked on fallout 2 and new vegas. 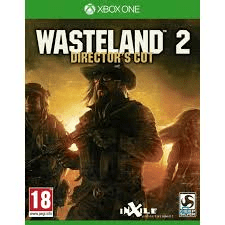 In 2012 InXile (fitting name) started a kick starter for Wasteland 2.it raised $3 million for it. It smashed expectations. However, these days that amount isn't a ton for a AAA title, but that's ok, it was still more than expected. Apparently it's quite the awesome game, and more similar to the old fallout 1 and 2,and could be treated as a side story. Fallout 1 & 2 had a ton of humor in them to balance out all the post-apocalyptic stuff. They were great games even if I never made it very far because they are extremely brutal. I was so hyped when I heard Fallout 3 was happening, only to have my hopes dashed when it turned out to be an extremely dreary colorless Elder Scrolls game. But, Brian Fargo and inXile resurrected the spirit (mostly) with Wasteland 2. There's some humor in there, but not as much as Fallout 1 & 2. But mainly there's some color in the game, unlike Fallout 3. Yep, Fallout 3 was 'oblivion with guns' dull dull dull. Fallout 4 brought back the colors. So there's that at least. I'd recommend using the Fallout Fixit mod with 1 though. Fixes Only version if you want to play the game as originally released, but without the buggy parts. Could've at least made it over the shoulder like Star Wars: Knights of the Old Republic. To me nothing beats isometric squad/party views with turn based combat. I don't think folks have the attention span or time for those kinds of games anymore, everything is now "action RPG" or other "twitch & click" variant. Fallout was also the first RPG of its ilk that let you use explosive traps, grenades, energy weapons, all kinds of firearms and heavy weapons (formerly only seen in FPS). With Damage Types even! I also loved that a lot of the encounters had multiple resolutions (like the supermutant in #1 that you could either con, sneak past or fight, I played that scene 3 times to see what would happen). So with all the threads about lack of many (or many decent) post-apoc themes, maybe a Fallout Tactics style game would be cool ... all kinds of enemies from the original 3 for a crawler or light skirmish game.